Classic Bollywood poster of the blockbuster Hindi movie, Raja Hindustani (1996) for sale. 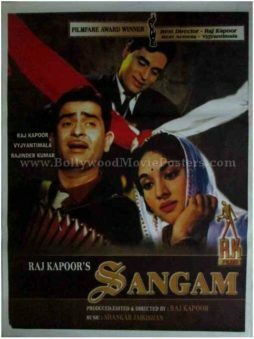 This is an actual surviving classic Indian film poster of the 1996 romance that starred Aamir Khan and Karisma Kapoor in lead roles. 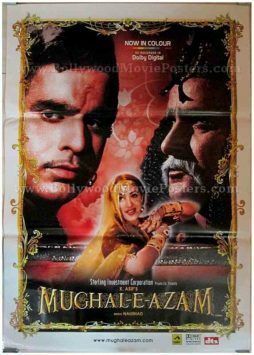 Printed and circulated somewhere in the late 1990s, this classic Bollywood movie poster was printed for publicity of the film but never ended up being used. Raja Hindustani was declared an “All Time Blockbuster” and became one of the highest grossing films of the 1990s. The film’s soundtrack album sold over 10 million copies worldwide, making it one of the bestselling Bollywood soundtrack albums of all time. Songs from the film, most notably “Pardesi Pardesi Jana Nahi” are played till today. 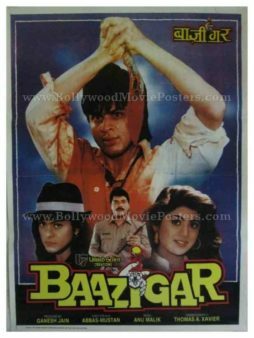 Raja Hindustani bagged 5 awards at the prestigious 1997 Filmfare Awards (including the Best Movie, Best Actor and Best Actress awards), making this classic Hindi movie poster highly collectible! The two lead actors are seen prominently in a romantic photographic still in this Aamir Khan movie poster. 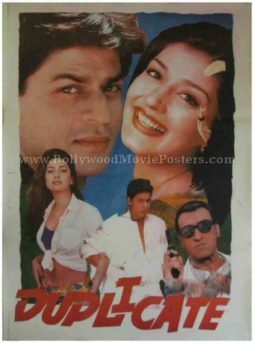 Classic Bollywood movie poster of the super hit Bollywood film Main Khiladi Tu Anari (1994) for sale. 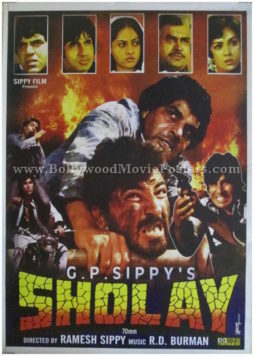 This is an actual surviving classic Bollywood film poster of the 1994 Hindi movie that starred Akshay Kumar, Saif Ali Khan, Shilpa Shetty and Raageshwari in lead roles. Printed and circulated during the initial release run of the film (somewhere in the mid 1990s), this Main Khiladi Tu Anari movie poster was designed for publicity of the film but never ended up being used. 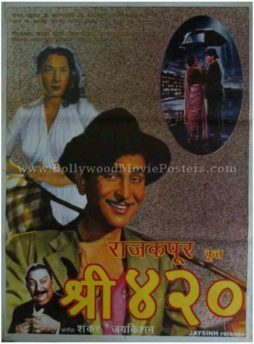 An interesting collage of photographic stills taken mainly from the super hit songs of the film is seen in this Main Khiladi Tu Anari poster. The soundtrack of the film was a smash hit upon its release. Songs like “Chura Ke Dil Mera,” “My Adorable Darling” and the title song “Main Khiladi Tu Anari” became instant chart toppers upon the film’s release. 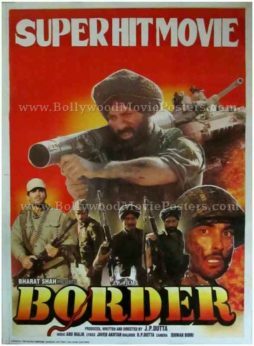 Classic Bollywood film poster of the blockbuster Hindi movie, Border (1997) for sale. Border went on to become one of the finest patriotic films ever made in Indian cinema, making this Border film poster highly collectible! 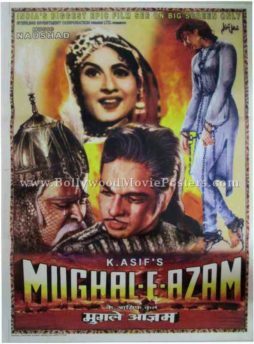 Printed and circulated a few years after the first release of the film, this classic Border Hindi movie poster was originally designed for publicity of the film but never ended up being used. 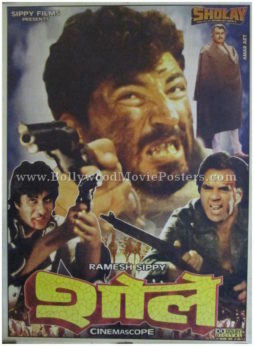 This Border film poster features key characters from the war movie, the most prominent of them being Sunny Deol, depicted on the center of the poster. Suniel Shetty, Akshaye Khanna and Puneet Issar are seen at the bottom. 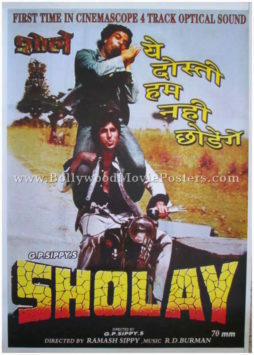 The typography used in this Border Hindi film poster is entirely in English. The poster is set against a stunning red and yellow background. Classic Bollywood film poster of the blockbuster Hindi movie, Raja Hindustani (1996) for sale. 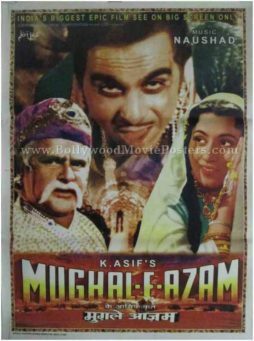 This is an actual surviving classic Bollywood film poster of the 1996 romance that starred Aamir Khan and Karisma Kapoor in lead roles. 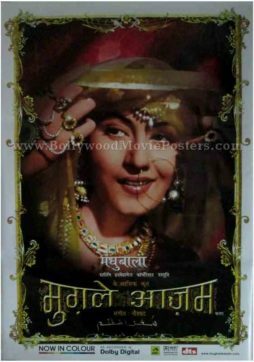 Printed and circulated somewhere in the late 1990s, this classic Bollywood film poster was printed for publicity of the film but never ended up being used. 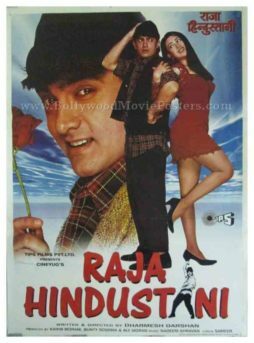 Raja Hindustani bagged 5 awards at the prestigious 1997 Filmfare Awards (including the Best Movie, Best Actor and Best Actress awards), making this poster highly collectible! The two lead actors are seen prominently in photographic stills in this Aamir Khan movie poster. 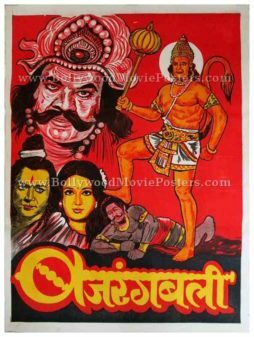 Old Indian Hindu mythology poster of the Hindi film, Hari Darshan (1972) for sale. 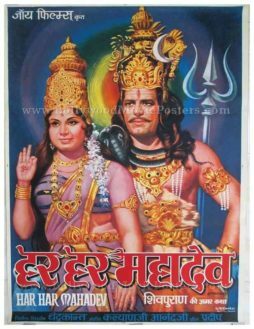 This is an actual surviving publicity poster of the 1972 mythological Hindi film that featured award winning wrestler turned Bollywood actor, Dara Singh in the lead role. 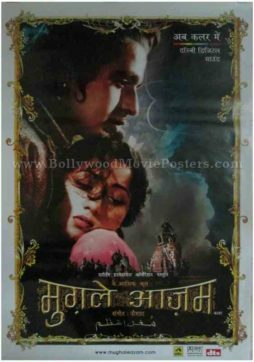 Printed and circulated several years after the first release of the film (somewhere in the early 2000’s), this Indian mythological poster was printed for publicity of the re-release of the film but never ended up being used. 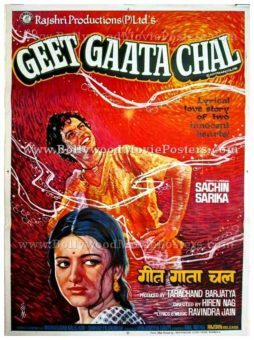 This hand painted poster was originally designed on a hand drawn canvas by popular Bollywood movie poster artist/painter G.R. Kareker, and bears his signature on the bottom right hand corner, making the poster highly collectible. 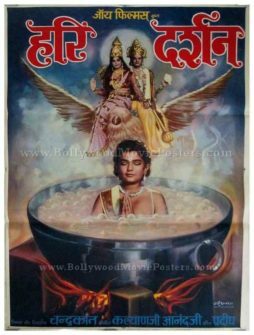 Devotee Prahlad is seen in the poster in a pot of boiling oil subject to an attempted assassination by his father Hiranyakasipu. Lord Vishnu, his savior is seen in the background on the top. Vintage hand drawn Hindi film poster of the old Indian mythology, Bajrang Bali (1976) for sale. This is an actual surviving vintage Bollywood poster of the 1976 Hindi film that featured award winning wrestler turned Bollywood actor, Dara Singh in the lead role as Hanuman. 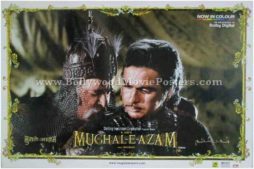 Printed and circulated several years after the first release of the film (somewhere in the 1980s), this Hindu mythology poster was printed for publicity of the re-release of the film but never ended up being used. This poster was originally designed on a hand drawn canvas using exceptionally bright and eye-catching colors, making it highly collectible. 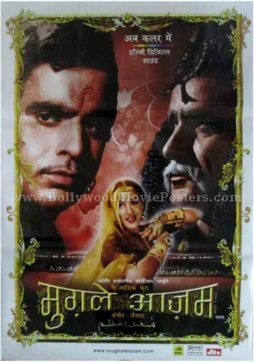 Wrestler turned Hindi film actor Dara Singh playing the role of Hanuman, is depicted in a portrait on the right hand side of the poster. Hanuman appears standing victorious over his evil opponent, whose head is seen under Hanuman’s foot. Raavan’s evil face is seen in a large portrait in the background on the left. Ram and Sita are depicted together on the bottom left of this Hindu mythology poster. 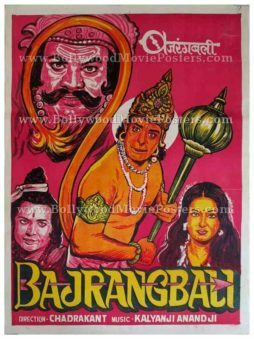 Bajrang Bali is a 1976 mythological Hindi film starring wrestler turned Bollywood actor, Dara Singh playing the title lead role of Hanuman. Vintage hand painted Bollywood movie poster of the mythological Hindi film Bajrang Bali (1976) for sale. 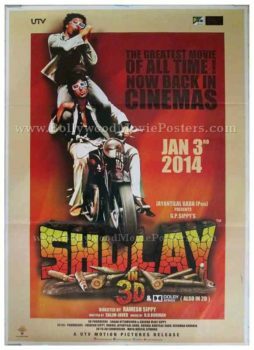 This is an actual surviving Indian mythology poster of the 1976 Hindi film that featured award winning wrestler turned Bollywood actor, Dara Singh in the lead role. Printed and circulated several years after the first release of the film (somewhere in the 1980s), this movie poster was printed for publicity of the re-release of the film but never ended up being used. This Indian mythology poster was originally designed on a hand painted canvas using exceptionally bright and eye-catching colors, making it highly collectible. Dara Singh is depicted in an amazing hand drawn portrait (in bright orange) as Hanuman in the center, with Ram and Sita flanking each of his sides. Raavan’s evil face is depicted inside Hanuman’s tail, signifying triumph of good over evil. 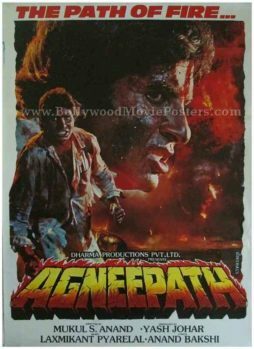 The typography used for the film’s title shows an arrow piercing its length, revealing the action genre of this mythological Hindi film. Old hand drawn Bollywood movie poster of the mythological drama Har Har Mahadev (1974) for sale. 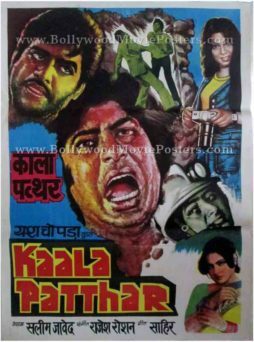 This is an actual surviving Bollywood poster of the 1974 Hindi film that featured award winning wrestler turned Bollywood actor, Dara Singh in the lead role. Printed and circulated several years after the first release of the film (somewhere in the early 2000’s), this movie poster was printed for publicity of the re-release of the film but never ended up being used. 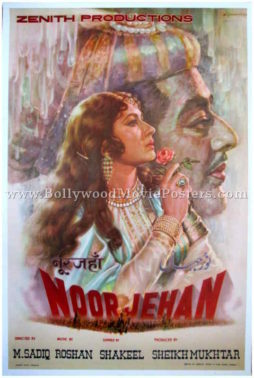 This poster was originally designed on a hand drawn canvas by popular Bollywood movie poster artist/painter G.R. Kareker, and bears his signature on the bottom right hand corner, making the poster highly collectible. Dara Singh is depicted in a beautiful hand drawn portrait as Lord Shiva, with a snake wrapped around his neck and a trishul on his back. Har Har Mahadev (1974) is a mythological Hindi film starring Dara Singh in the lead role as Lord Shiva. The film is an adaptation of the story of Lord Shiva, which is also referred to as the ‘Shivpuran’.